CONFINED is a confronting exhibition featuring work from indigenous Australians who have spent time in jail. The exhibitors include Dennis Thorpe, who said he was wanted to use his own life story in the lines of his painting, which were a departure from the popular style of Aboriginal dot painting. “I’m not into the dots, I like the lines in the story and the camouflage of this piece which is doing the talking for the Aboriginal people and for their struggle,’’ he said. The exhibition also highlights the over representation of indigenous people in the prison system, and promotes the role of culture in rehabilitation. The Torch cross-cultural arts organisation’s indigenous arts officer, Kent Morris, said the exhibition gave Aboriginal and Torres Strait Islanders in prison an opportunity for feedback on their work and support for their creative development. Mr Morris said he had found it hard to choose pieces to exhibit. “Some of this work blows me away,” he said. “One artist has only been doing art for six months and already his work is of such a high level. Mr Thorpe said he hoped to set up a cultural centre where former indigenous inmates could go to for art supplies and to work. “Otherwise they might just get home and sit down and the ability to carry on the cultural work in the art is lost,” Mr Thorpe said. This is the fourth Confined exhibition. 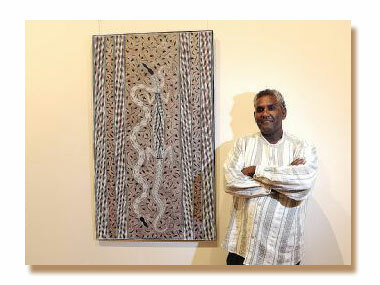 It runs at the St Kilda Town Hall until March 7.